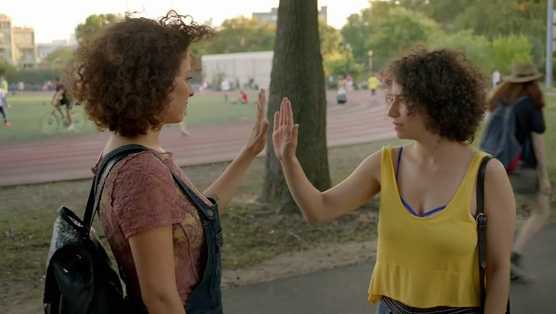 Broad City Review: "Coat Check"
While Abbi and Ilana are far from opposites (last season former coworker Morgan dismissed them both as “druggie lesbian Jews”), the Broad City girls definitely have their differences, qualities the show explored in detail last night by holding a mirror up to each. At times, quite literally, like when Ilana and guest star Alia Shawkat paid tribute to the mirror routine from Duck Soup. For Abbi Jacobson, that meant some quality time with Kelly Ripa, an appropriate celebrity stand-in for her character’s weirdly WASPy passions. For Ilana Glazer, it meant a dalliance with the previously mentioned Shawkat, who both looks like Glazer and may well have prototyped the Ilana role as reckless schemer Maeby Fünke on Arrested Development. Before all that, though, there was also some very fun and funny coatroom vaping and a welcome cameo from David Wain, playing one of the random New York eccentrics whose apartments the girl seem to continually find themselves in. Ultimately, I found Abbi’s scenes with Ripa much funnier than Ilana’s storyline. We’ve seen celebrities play depraved versions of themselves in the past (some memorable examples: Neil Patrick Harris, Bob Saget, Will Arnett), but rarely someone with a persona as downright wholesome as Ripa’s. By contrast, the Ilana story mostly played like a lesser version of Seinfeld’s “The Cartoon,” the episode that had George dating a woman that looked eerily like his best friend. Ingenuity hardly matters, however, when the gags are as solid as the ones in “Coat Check.” I’m not sure what, if anything, Abbi and Ilana learned during this week’s introspective Broad City, but it sure was fun to watch.